Charles Calvert's painting of trains passing at Newton-le-Willows (or Newton-in-Makerfield as it was more likely known at the time) has been widely reproduced despite obvious defects in perspective with regard to the train on the right. Many, however, have queried the supposed date, 1825, given that the railway started operation in late 1830. It has been suggested as a consequence that the painting was done for a prospectus and that the details of the trains were inspired by the extant Stockton & Darlington Railway. Indeed, there are many curious and interesting features worthy of discussion. The version above is CC BY-NC-SA from the Science Museum. They list the artist as Charles Calvert. Calvert was a self-taught landscape artist who gave up a career as a Manchester cotton merchant to focus on art. He was born in 1785 so would have been 40 when he painted at Newton. He had been creating credible artworks since at least 1814, the Government Art Collection having one of several views of the Thames he painted around that time. He is credited with being a founder member of the Manchester Royal Institution so was presumably resident there at the time of its formation in 1823. There are a number of letters from him in Manchester Archives dated around 1830. He worked as an art teacher but also painted in the Lake District. He won both gold and silver Heywood Medals for his landscapes. He was clearly an accomplished artist and one imagines that as a teacher he had a good command of perspective even if this was not a primary requirement for his own work. Whether he was used to the requirements of aquatint production is a moot point. The engraver is listed as Havell, presumably one of the highly accomplished Havell family from Reading, Berkshire. I have yet to track down the publisher. The Havells did work for Rudolph Ackermann (who subsequently published many railway prints) but it is equally possible that they published it themselves. 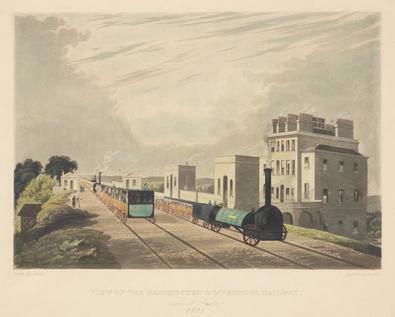 The title "View of Manchester and Liverpool Railroad taken at Newton 1825" replicates the company name used in Gore's Liverpool directory of 1829 for the offices on Dale Street and Clayton Square. Quite when Liverpool and Manchester Railway (L&MR) became the norm outside the company requires further research. 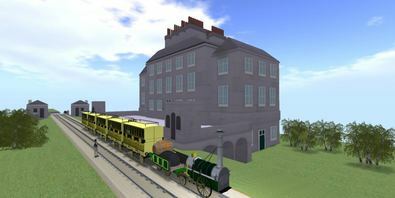 The rollingstock as shown are nothing like the engines and carriages used on the S&DR at its opening in 1825 though they are a reasonable approximation to those used on the L&MR in 1830, albeit that the locomotive lacks pistons and the position of some of the men sitting on the outside is odd. The absence of a cask for water storage behind the locomotive suggests that this engine is modelled on Northumbrian which was built in 1830. Bear in mind that the decision to use steam locomotives and thus the Rainhill Trials only took place in 1828 and that the evolution of the engines was intense at this time. The trains comprise five-or-so carriages which was the norm at the start of the L&MR. The yellow colour of the closed carriages denoted first class although we can see at least one open (presumably second class) carriage as well which were normally blue. Mixed class trains would have been very unusual at this time. The carriages are notably devoid of roof luggage. This might make sense if trains were participating in an excursion. This might also explain the close proximity of the third train in the distance if the destination was Newton rather than Manchester. Admittedly there are few passengers debarked but that at least simplifies the aquatint and reduces distractions. The presence of trains on both tracks may reflect the fact that Newton is midway between Manchester and Liverpool with trains normally starting from each city at the same time and hence, all being well, meeting at Newton where passengers can debark and stretch their legs. Alternatively, a multi-train excursion might run to Parkside and back after dropping passengers at Newton or a second pair of trains would be waiting at Newton to do the return journey. The station buildings can also be seen in pictures by other artists although in later paintings the small building on the hotel side has been replaced with a more modern station. The railway here is on a steep embankment and one might suppose that the ramp down to the road was on the hotel side. Although I have been unable to find maps showing the station at this time, there are complaints recorded regarding the steepness of the ramp. Notably missing is a water crane although there is one nearby at Parkside. The hotel is the Old Legh Arms which was itself built in 1830, presumably to cater for the railway trade given its proximity. Newton at this time was small and fairly rural but still significant in county terms and, of course, it later grew significantly with the arrival of nearby railway and chemical works. It was the scene for rural fairs and horse racing as well as excursions so a good place to put a hotel catering to city-dwellers wanting overnight accommodation or refreshment. Later the hotel would be taken over by George MacCorquodale for use as a printing works. As such, it did an excellent trade in printing timetables and guides for railway companies such as the LNWR. The hotel also appears in other paintings, the most notable difference being the smaller size of the two gatehouses that provide access to the front garden. The wall clearly defines the edge of railway property -- this is not part of the station. 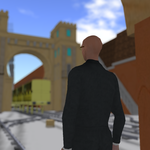 The OpenSim build shown below probably exaggerates the size of the hotel. Frankly the painting continues to baffle. It seems hard to believe that it was intended to represent 1825 as the trains and buildings are so typical of 1830 which is a more likely date for its creation. Other paintings show that 1830's Newton was very similar to the view we see here. Is the date shown a mistake or an attempt to add value (via nostalgia or faux-novelty) or to differentiate it from other views? Perhaps the publisher wanted to cash-in on the vogue for railway pictures and this came readily to hand, warts and all, because it had been produced for a different purpose. The possibility that the painting was originally produced as a prospectus is interesting, especially if it was produced for the hotel (which might want it less obscured by trains). One can imagine Calvert being asked to do a "rush job" although delivering the view given would need close collaboration between architect and railway company if completed pre-1829, say. Another possibility is that is was created (or reused) as a memento for excursionists. The first railway excursion took place in 1830 just after the railway opened. The trains stopped at the impressive Sankey viaduct and a meal was taken at a large hotel nearby (The Old Legh Arms would be a likely candidate). There is a distinct opportunity to sell a print to wealthy excursionists wanting a memento of their first trip by train. 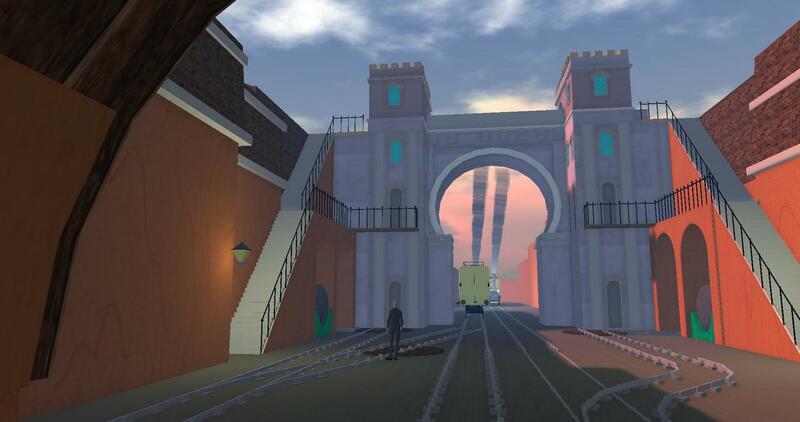 Of course, it also serves as excellent advertising for the hotel and excursion as well as promoting the railway as a useful means to access the countryside and escape the city grind. Win-win!